Chicago is the third most populous city in the United States, after New York and Los Angeles. It's located in Cook County which is the second most populous county in the United States, with 5.3 million people! One of the cool things about Chicago is that it is the birthplace of the Skyscraper. Just like New York and Los Angeles, there is so much to do and see! I had the opportunity to visit Chicago recently, and I have to say I was amazed. From the Cloud Gate to Marilyn Monroe, there are endless iconic American spots to see. For those who like shopping, there is the Magnificent Mile. You can find various flagship stores from brands such as Under Armour to haute couture legends such as Chanel. If you’re looking for something to eat, make sure to try Chicago’s world-famous hot dog or deep-dish pizza. The Skydeck Chicago is located in the heart of Chicago at the top of the Willis Tower. The Willis tower 1400 ft tall (426.4 Meters), and was the tallest tower in the world for 25 years! The Skydeck is the highest observation deck in the United States. More than one million people visit this Chicago icon every year. This is definitely not a spot you want to miss! Buckingham fountain is located in the center of Grant Park in Chicago. It is one of the largest fountains in the world. It operates between April and October and has regular water shows and is lighted in the evening. If you're in Chicago during the winter, it is decorated with festival lights giving it a festive feel. Chicago’s Museum of Science and Industry is the largest science museum in the Western Hemisphere! It is located in the Hyde Park neighborhood along Lake Michigan, in Chicago. Some of the cool exhibits this museum showcases are a full size coal mine replica, a German submarine from World War 2, and a collection of various planes! In addition to its permanent exhibits, the museum hosts traveling exhibits so be sure to check it out while you're in town! Located in Garfield park, it is one of the largest greenhouse conservatories in the United States. You can find thousands of diverse species of plants. The conservatory is housed entirely under a glass roof and is about 18,000 meters squared. Chagall’s Four Seasons is a mosaic located in the Chase Tower Plaza in downtown Chicago. The mosaic is wrapped around the four sides of 70 ft (21 m) long, 14 ft (4.3 m) high, and 10 ft (3 m) rectangular box. Taste of Chicago is the world’s largest food festival and is held for 5 days in July. You can find the festival in Grant Park, not too far from the Buckingham Fountain. There is also live music where you can find different bands playing each year. In 2005 alone, this festival attracted over 3.9 million people, so you know the food must be good! Don't miss this one! The University of Chicago was founded in 1890 and is ranked as the 10th best university in the world! Our former President, Barack Obama taught at the university’s law school. The campus of the school is 217 acres (87.8 ha). I had a chance to visit here when I last visited and I have to say it is a very pretty campus. Its located in the Hyde Park district which is home to many museums, green spaces, and so much more. The Shedd Aquarium, for a long time, was the largest indoor aquarium in the world. In 2015 alone, it had over 2 million visitors! It is home to over 32,000 animals! It is located on the Lake Michigan shoreline and is a short walk from downtown Chicago. 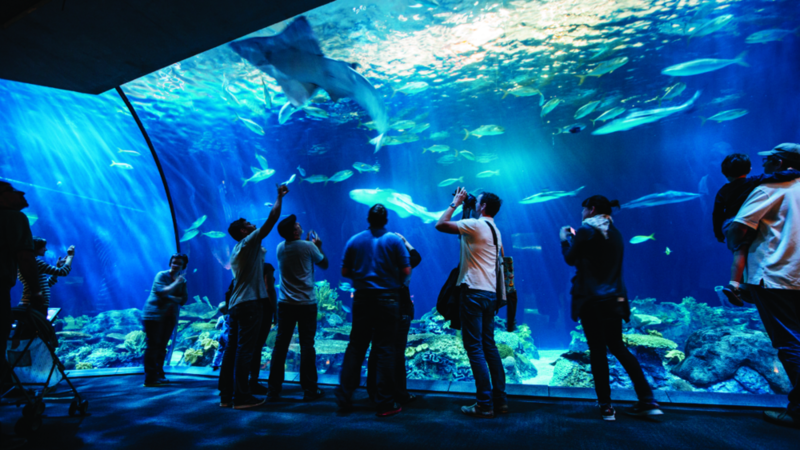 The aquarium offers many 4-D experiences, live shows, and many more interactive exhibits. If you find yourself at Shedd, you definitely don’t want to miss the dolphin show. Maxwell Street Market is one of Chicago’s oldest residential districts. It was also one of the most diverse districts, home to Greeks, Russians, Italians, and many other immigrant groups. It is also home to the “Maxwell Street Polish”, a famous Chicago sandwich. If you’re into music, it's also the birthplace of the Chicago blues. Once an elevated railroad over 2 miles long (4.3 km), is now a greenway. It is the longest linear park in the Western Hemisphere, and the second largest in the world. It’s definitely a spot to check out if you want to take a short walk in nature. The Art institute of Chicago is one of the oldest and largest art museums in the United States. Over 1.5 million tourist visit this museum every year! You can find art from ancient times modern. It has the largest collection of Impressionist and Post-Impressionist art, only second to the Louvre in Paris. Like most of tourists attractions in Chicago, it is located downtown and is a short walk from many other iconic spots. Navy Pier is a 3,300 ft long (1,010 m) pier on the Chicago shoreline of Lake Michigan. It was once used as a training center for the United States Navy during World War 2; hence its name, Navy Pier. It is home to parks, gardens, restaurants and shops. It is considered to be the top leisure destination in the Midwest of the United States. Don’t forget to take a ride on the Navy Pier ferris wheel, where you can catch some breathtaking views of Lake Michigan and Chicago. When in season you can catch a breathtaking view of the fireworks on Wednesdays and Saturdays. Why not take a cruise on Lake Michigan? Chicago is located on the coast of Lake Michigan, one of the Five Great Lakes. This lake is over 300 miles long (or 482 Kilometers) and is entirely within the border of the United States. To take a cruise, simply go to Navy Pier. Chicago has things to do and see for everyone, so check it out! Skyscraper (Noun)- A very tall building. Fireworks (Noun)- a device for producing a striking display by the combustion of explosive or flammable compositions. Pier (Noun)- a platform supported on pillars or girders leading out from the shore into a body of water, used as a landing stage for boats. Ferris Wheel (Noun)- an amusement-park or fairground ride consisting of a giant vertical revolving wheel with passenger cars suspended on its outer edge.Greenway (Noun)- a strip of undeveloped land near an urban area, set aside for recreational use or environmental protection. Blues (Noun)- melancholic music of black American folk origin, typically in a twelve-bar sequence. It developed in the rural southern US toward the end of the 19th century, finding a wider audience in the 1940s as blacks migrated to the cities. This urban blues gave rise to rhythm and blues and rock and roll. Brendyn Lupe is a senior at American University, studying International Relations and French. He likes reading, playing the piano, and hanging out with his friends during his free time.